Heavy rain is expected in parts of Yorkshire on Wednesday morning. 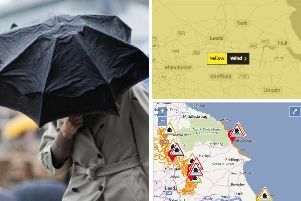 The Met Office has issued a warning for the west of Yorkshire as a spell of heavy rain and high winds threatens flooding and damage to homes. The Yellow Warning has been issued from 1am on Wednesday through to 11am, with the worst of the rains expected to affect the morning rush hour. A Met Office map show how the heavy rain will cross into western parts of the county and reach as far across as Harrogate and taking in Bradford. The website warning states: "A spell of rain, heavy at times, is expected and will be accompanied by strong winds. "Flooding of a few homes and business is likely. Bus and train services will probably be affected and spray and flooding is expected on roads, this all making journey times longer." The Met Office Chief Forecaster added: "Spells of rain, heavy at times, will affect the region overnight and on Wednesday morning. "The heaviest rain is looking likely to fall late in the night and first thing in the morning. The highest rainfall totals are expected over the northern part of the warning area where 40-50 mm of rain is likely whilst further south 20-30 mm of rain is expected." It is the latest in a long line of weather warnings issued by the Met Office following a week of icy conditions which brought snow and high winds to many parts of the county. In stark contrast, Tuesday's temperatures have been much higher, soaring into double figures and above those experienced in Athens and Rome.